To compose my photomontage scenes is a detailed, thoughtful process that can take 3 to 6 weeks. To start, I make 3-4 trips through the area I want to capture. Using a Canon 6D DSLR, I take many photos and walk with a heightened awareness; staying open to all that is around me. I roam up and down main streets and side streets to thoroughly take in the area and capture what seems to be unique to the area. Once in my studio, I start the long process of editing the photos. I hone into the images of buildings, people, signage, etc, that best represent what I want to express. I finally select a set of images and using Adobe Photoshop, I isolate them from the background so they are stand-alone objects that can be placed anywhere in a scene. Next, the most time consuming part. While still using Photoshop, I slowly compose a scene with these isolated pieces. I try many different iterations; seeing which objects fit best together visually but also contextually. I focus on scale, depth, and what should have more focus. This is one of the most exciting steps for me; I feel like I am solving a complex puzzle. I know I am close to done when everything seems to start falling into place. I use many media types to print these final scenes I primarily use archival pigment inks on cotton rag paper, but I can also print on wood, acrylic, and fabric. 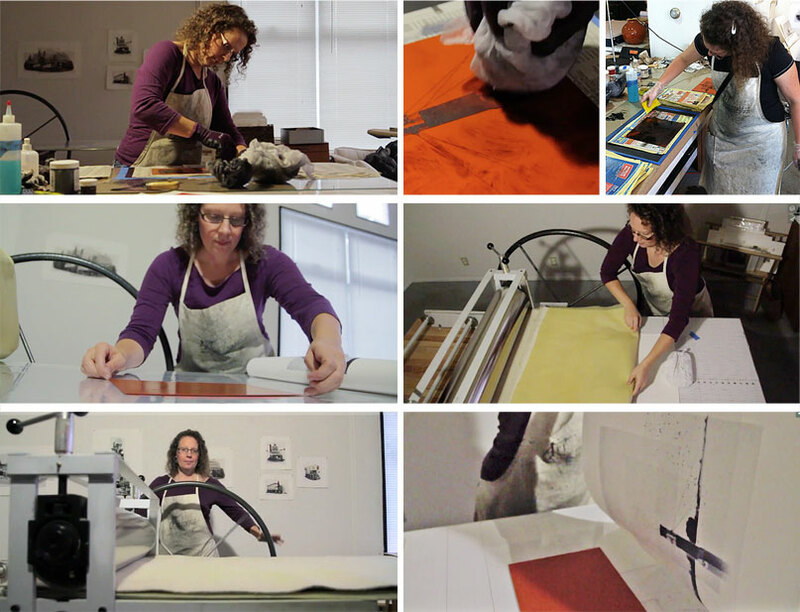 I also create hand-printed etchings…that process is explained below. Once I am happy with the photomontage scene, I break it up into different sections and print out each one onto transparency film. I am now ready to make plates. I place the transparency film on a photo-sensitive etching plate (in my case a Solarplate) and shine U.V. light through it. Then the plate is placed in water. This etches the light exposed areas and leaves grooves that match the image I want to print. To print the image on paper, I rub ink into the plate and thoroughly wipe off the excess. Since I use multiple plates per print, I first ink and wipe all the plates to prepare them to print. Once I am done, I lay damp paper onto the plate and roll both together, under pressure, through an etching press. Most of my scenes contain at least 5 different plates so I use a registration sheet to keep the composition together. I lie the registration sheet down on the press and build the complete scene a couple plates at a time. I place the background elements first (send them through the press) and then the foreground images. A final piece can take up to four passes through the press.